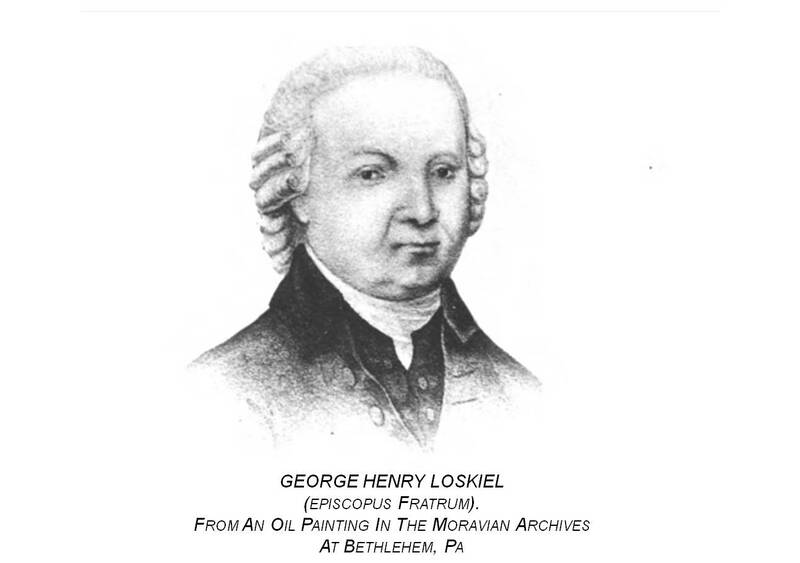 George Henry Loskiel was born on November 7th, 1740, in the town of Rinda, Latvia. His traditional name was Georgs Heinrihs Loskīls. He is most often cited by the German translation for his name Georg Heinrich Loskiel. At the age of 19, he joined the Moravian church on December 26, 1759, and enrolled in a program to learn theology and medicine. He served as an Evangelical Lutheran pastor at a number of the parishes in Latvia (just north of Poland, in Livonia)during his earliest years. In 1765, he became a teacher for the Moravian Paedagogium in Niesky. 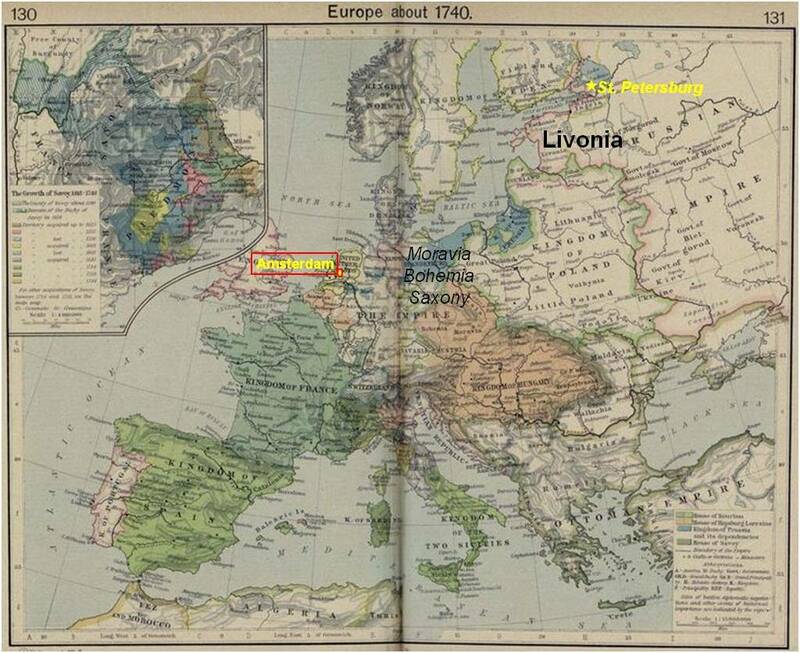 In 1766 he removed to Neuwied, and two years later to Marienborn, and finally Amsterdam in 1769, where he also married Maria Magdalena Barlach about two years later. In a summary listing of activities that took place at or near his father’s Lutheran ministry in Angermunde, Curland, he is noted with others completing their work in Curländischer Kirchen-Geschichte, von dem Zustande dieser Provincial-Kirche, bis zum Ableben Gotthards ersten Herzogs zu Curland, nebst der gegenwärtigen äusserlichen kirchlichen Verfassung dieses Herzogthums by Carl Ludwig Tetsch (p. 280; Leipzig, 1767). In 1782, he was appointed deputy of the presiding presbyter Peter Hesse, and became presiding presbyter (Oberpresbyter) of the Moravian Church in Livonia in 1785, and appointed to serve as an agent for a church in Russia. In 1789, he moved to Saint Petersburg in order to lead the Moravian Brethren congregation located in this Russian capital. Soonafter, he returned to Saxony where he founded an educational establishment in the congregations of Kleinwelke (near Bautzen) and Gnadenfrei (now Piława Górna). During the first half of his professional life with the Church, Loskiel was a fairly successful writer. In 1771 his efforts were associated with Het kerkengebed der evangelische broeder-gemeente (C. H.Bohn, 1771). 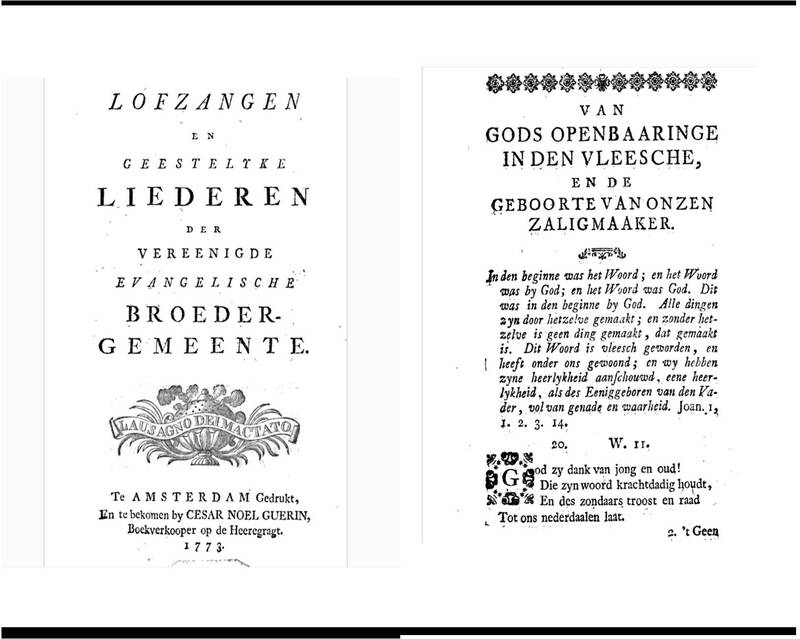 This was followed by Lofzangen en geestelyke liederen der Vereenigde Evangelische Broedergemeente () in 1773. In 1781, his Passions- und Oster-Gesang developed a successful readership. 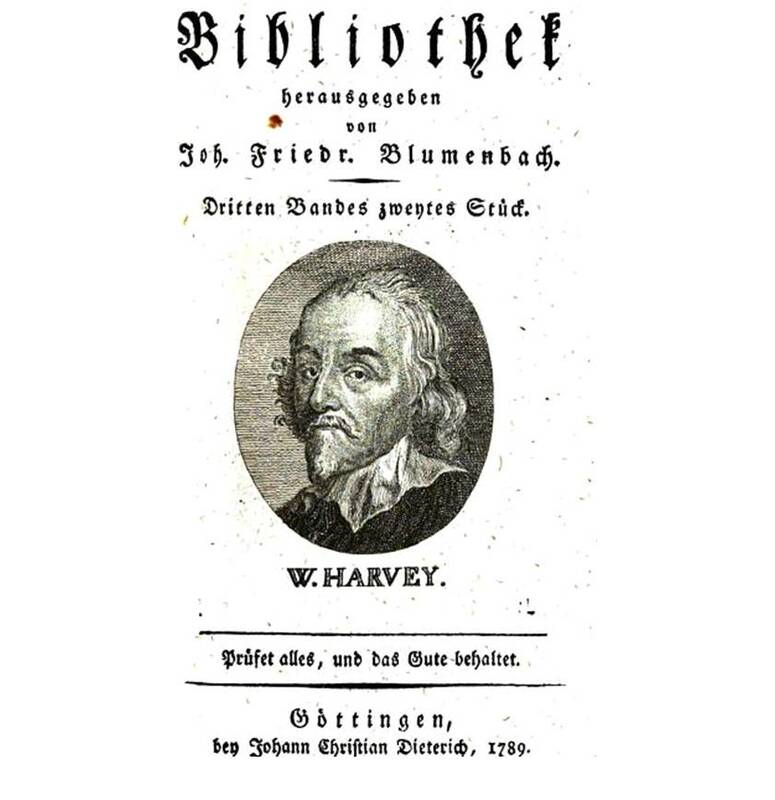 In 1796, his Gebete und Betrachtungen in Versen auf alle Tage was published. These publications, which focused on the evangelical needs of his people, helped to set the stage for the later work he would do on the success of the Moravian Indian missions and the story of how the Iroquois and Algonkin Indians were converted due to this success. The Native American missionary movement was by now more than a century old, yet the success of these missions with Native Americans in the Northern, Middle and Southern parts of the Americas had progressed very little since the first voyages to these regions. One of the major set backs of these missions was of course the impact that infectious diseases were having on Natives as the contacts continued to take place. These epidemics continued to prevail on and off for decades, taking numerous lives at times, often leading to violent encounters between colonists and natives. A century into this part of the colonial experience, some of these event were lessening in frequency, but were still evident due to the newborns that often suffered due to exposure to these and other diseases that mostly children were susceptible to, events that would be repeated for each new generation. These effects along with the ongoing impacts of treaties and governmental relationships with Native American groups had the effect of removing some of the tribes not yet removed due to treaties and/or the need for new lands and their natural resources. A number of writers paved the way for Loskiel’s work on the Native American groups his missionary program. Early Jesuit missionary writer Arnold Montagnes penned his description of native life as a part of his description of New Netherlands. Cornet produced a fairly useful review of settlements located at the Canadian border just north of New Netherlands. Champlain’s work covered the upper eastern part of New York, westward towards what is now Ohio. Jacques Cartier had just published his work on the Quebec region, with insights into a culture that overlapped with the lower New York settings. Finally, Cadwallader Colden had just published his work on the Iroquois, the single most important background reference for Loskiel’s work. York region where the Moravian missions were set up. Some of these observations were reinforced by a related treatise produced by Jesuit Hennepin’s description of the upper Mississippi valley region. (This was later found to consist mostly of plagiarized materials from other writings; but as for contact, it is reliable.) There was also a series of smaller letters produced that detailed previous interactions that took place with shoreline communities just north of New England, due to accounts of new explorers adding to what we learned from the first explorations of these shoreline settings. 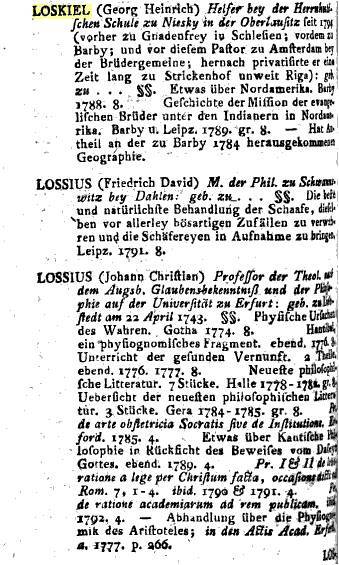 In 1789, Loskiel’s work Geschichte der Mission der Evanglischen Bruder unter den Indianern in Nordamerika was published in Barby, Leipzig. Five years later an English translation of this book was produced by Christian Ignatius Latrobe (1758-1836), titled History of the Moravian Mission among the North American Indians (London, 1794). In 1800, with the dawn of a new century came a religious revival. This revival first made its way through parts of Western Europe eastward towards Russia, and then found its way across the oceans to North America. This “Second Great Awakening” for North American history led Loskiel to move to the United States in 1801 (the “First Great Awakening” took place in the Dutch-English Mid-Atlantic setting during the 1720s and 1730s). This same year, his Etwas für’s Herz auf dem Wege zur Ewigkeit. 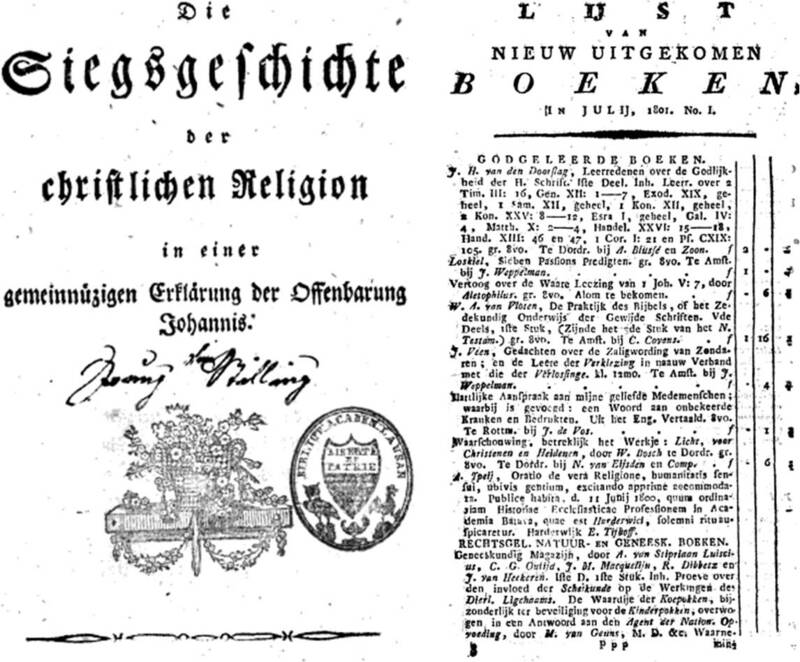 (“Something for the Heart on the Way to Eternity”) was published in Bautzen (1801), containing the daily meditations for the year. By the end of the year, he became President of the Direction of Pennsylvanian Congregations and preacher in Bethlehem, and in 1802 was consecrated to the episcopacy and appointed presiding bishop of the Northern district of the American province of the Moravian Church. He retained this office until 1811, when poor health forced him to resign. The following year, Loskiel was elected to the chief executive board of his church at Berthelsdorf, Saxony, a position that once again his poor health prevented him from fulfilling. Still residing in America, he was unable to leave this country due to poor health, and when health was no longer an issue, the ongoing disputes related to the War of 1812. As a result, he never left this country and died in Bethlehem in 1814. Loskiel was subsequently buried in a Moravian cemetery nearby. Loskiel’s life in the United States did not prevent him from continuing his work as a writer. In 1803 he wrote Extempore On A Wagon: A Metrical Narrative Of A Journey From Bethlehem, Pennsylvania To The Indian Town Of Goshen, Ohio, In The Autumn Of 1803, a lengthy metric recount of his experience travelling from Bethlehem, through Wyoming (PA), to the Gnadenhutten missions in Ohio. 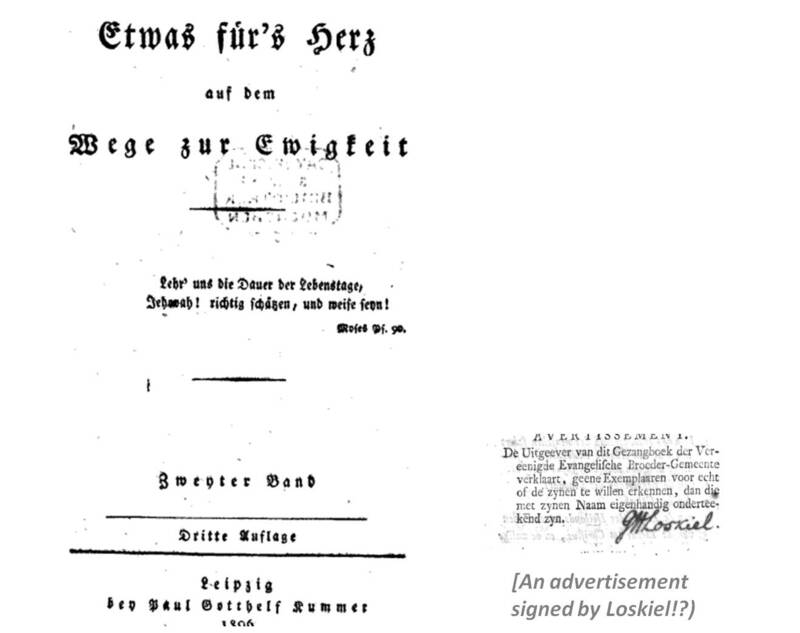 In 1806, Etwas für’s Herz auf dem Wege zur Ewigkeit (2 vols) was republished. In 1813, just prior to his death, his Gebete und Betrachtungen in Versen auf alle Tage des Jahres was republished by Reichenbach. Loskiel is considered “an eloquent preacher and a good writer”. However, when reviewing his work it is important to keep in mind that most of this writings are very culturally biased, in that it is very pro-Christian and in some ways written to serve as lessons for any later readers. Not that many readers are going to miss this point due Loskiel’s choice selections of phrases and his ‘Sunday School’ style of prose often posed to his readers. Loskiel’s work is heavily vocal because it includes in his own personal missionary statements. 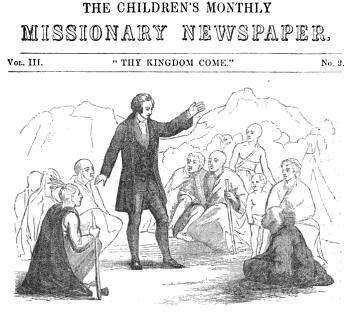 His work was designed not just to support the missionary movement, but also to provide its readers with lessons on the proper way to live, such as by avoiding activities brought about by greed and other sinful practices, and to remain free of sin. As a storyteller, Loskiel provides us with writings that can at times be inspirational, fascinating stories for his readers. As a historian, he provides us with only a few additional insights into local Native American culture, practices which fortunately were not modified too much in terms of their cultural context, applications, and meaning. One sign of a good story is how frequently is is retold. The most successful stories typically retain their meaning, but often become a victim of changes in wording and context over time. The longer a story remains an important educational tool within the Christian setting, the more complex it becomes, in spite of what little change has happened with its primary events. Based on this, the single most important story pertainingto Mahican history and the Moravian missions is the about Tschoop. If one were to reread Loskiel’s writings about Tschoop and other Mahican events and experiences in a Lutheran context, thesymbolism and its messages become clear. Martin Luther’s “true doctrines of the gospel” are exposed to us through the dogma expressed in Loskiel’s writings, not only as lessons in history but also as lessons in the storytelling process itself. Problems occur if we review Loskiel’s work for just its content but not its meaning. Only some of the physical characteristics, details and events are truths in the literal sense. May of them may in fact just be “Truths” in the Christian sense. Loskiel is trained in both theology and medicine. The amount of medicine he learned is not certain. No matter. In the theological sense, there is a certain value of disease assigned to everyone who suffers, be it a message that needs to be interpreted by theologians, or a message in need of review and correction by physicians. Loskiel’s writings, even though they were very heavily religious in meaning and purpose, did provide some valuable data to the less metaphysically (more physically) inclined doctors. For this reason, Loskiel’s work greatly satisfied the various members of the medical community. We find evidence for this very soon after his book was translated into English and then published. 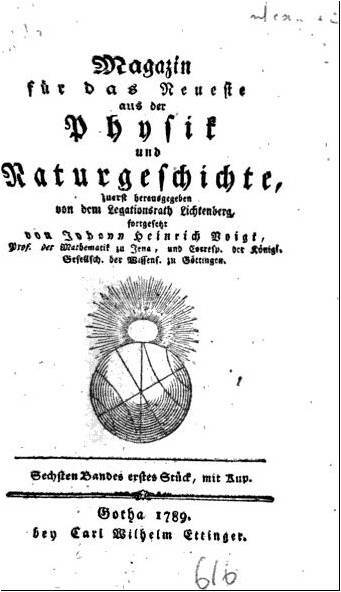 In a review of Loskiel’s book published in Magazin für das Neueste aus der Physik und Naturgeschichte (editors Georg.Christoph Lichtenberg and J. H. Voigt, Volume 6, 1787, pp. 164-177), a much more natural science approach is taken. One unique part of Loskiel’s work reminds the reviewed of the recent discovery of the harbor seal (Phoca vitulina), the migratory pigeon (Columba migratoria) and the electric eel (Electrophorus electricus). In Kungl. 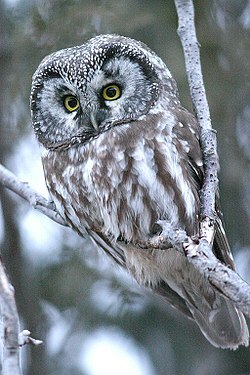 Svenska vetenskapsakademienshandlingar (Stockholm, Oct., Nov., Dec. 1793, p. 292), reference is made to Loskielin a discussion of Tengmalm’s Owl (Strix funerea), first identified in Linnaeus’s System Naturae, 1758. In the 1791 edition of Handbuch der Naturgeschichte edited by Johann Friedrich Blumenbach (Gottingen, p. 413), Loskiel’s mention of the production of wampum by the Iroquois is discussed, along with the production of a unique version of this well known barter item made using beads of colorful wood, and “Muschelschalen” or the shells of mussels. An identical note was later made regarding Gürtel von Muschelschalen or ‘Belt of Wampon’ by Johann Gottfried Herder in his Briefe zu Beförderung der Humanität, Volume 10 (Riga, 1797, p. 116). Sequels to this printing include notations of Loskiel’s writings by Johann August Donndorf in Zoologische Beyträge zur XIII. Ausgabe des Linnaeischen Natursystems, Volume 2 (Leipzig, 1795. p. 201, Avers Passerae COLUMBAS . . . migratoria). Sir Joseph Banks’ Catalogus bibliothecæ historico-naturalis Josephi Banks … Auctore Jona … (1798, p. 152) also makes reference to Loskiel’s work and contributions. This reference follows reviews of other Native American cultures written by Louis Hennepin (1698-9), Baron de Lahontan (1705), Cotton Mather (var.years), Pierre Francois Xavier de Charlevoix (1744), John Bartram (1751), Pehr Kalm (1753), Jonathan Carver (1766-8), William Bartram (1773) and Johann David Schoepf (1783). In Apparatvs medicaminvm tam simplicivm qvam praeparatorvm et compositorvm in Praxeos Adivmentvm Consideratvs, Volume 5 (Gotitngae, 1790) by Johan Anders Murray, the results of a chemical inquiry into “succus Aceris saccharini” (maple syrup) were published. According to the authors of this work, this product was introduced to the world by Pedr Kalm (Kongl. Vtt. Acad. Handt. 1751. p. 147). A. Wangenheim (Beytrag zur Forsiwijsenschaft, p. 26. Mem. d’agriculture de Paris 1787. Printems p. 49), Schôpf (Reise durch N.Amerika, vol 1 p. 417), and Loskiel (Geschichte d. Mission der evangeí. Bruder unter d. Indianern in Nordamerika). The sacchari produced from “Aceris species Saccharum” was compared with substances produced from ‘Juglandes and Betulae’, Aloës, Agave americana, ‘succus florurri Asclepiadís Syríacaê’ (butterfly weed flowers) , ‘Zeae Mays’ (corn), ‘Heraclèum Sphondylium’, ‘Kamschadalensibus gratum’, Fucus saccharinus, ‘Istardorum delicium’, and the products of rootstocks produced by ‘Betae rubrae’, ‘Ciclae’, ‘Sisarí’, Caricae, ‘Passulaei’, Pruna, Jujiíbae, Siliqua dulcis, Dactyli, and ‘Manna’. 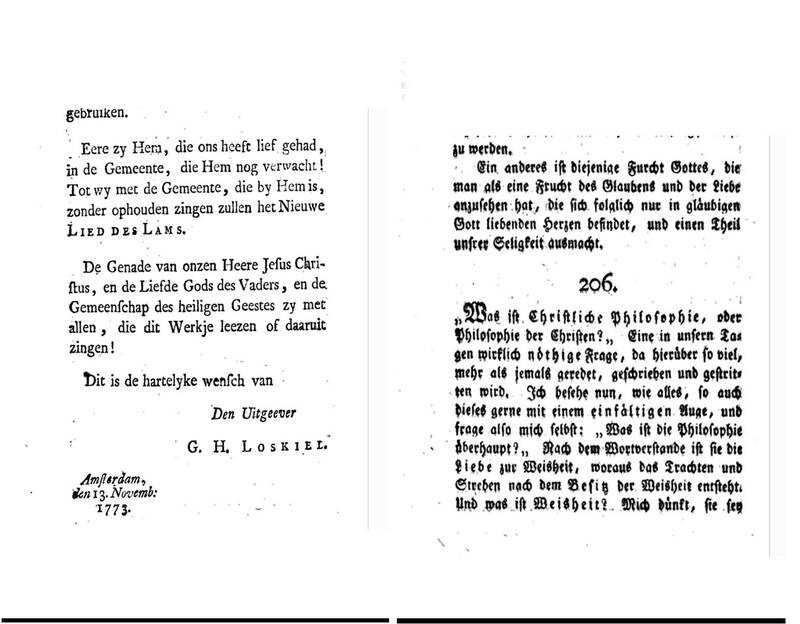 In Medicinische Bibliothek, Volume 3 (1789), a book review was published immediately following the distribution of Loskiel’s book. This review briefly focused on the practice of cold bathing by the Iroquois and Delaware Indians (the Mahicans were not distinguished by Loskiel in this book). He also commends the additional knowledge Loskiel provided regarding the uses for the herbs “klapperschlangen” (polygala senega), fraxinus caroliniana, aristolochia serpentaria, cornus florida, and sambucus canadensis. The oil or tar found in the wild was noted as well, referred to as “Bergol”. Medicine was again taking a turn towards a focus on chemistry and the body when Loskiel’s book was published. A number of toxins had been identified which were considered to be the cause for the effects of certain plants. Nevertheless, Loskiel remained true to his beliefs in the metaphysics of disease and healing, and like the many writers before him who wrote about snake roots, took a fascination for this ability of the snake to place its prey in state of “fascination,” as he referred to it. The writers of his book review follow suit on this. The review of this book published in Journal de Medicine, Chirurgie, Pharmacie, . (July 1790, p. 301) provides us with additional detail into the specifics of several of American herbs purported popular to the local American Indian communities. Aside from reviewing the snake roots again (of all the European writers, the French were perhaps the most fascinated with the charming of the snake), Cornus florida and Sambucus canadensis are noted, in particular for their preferred use by Natives instead of Cinchona or quinquina for treating the fever. In severe cases, the equivalent to the European cold bath is recommended, in which someone jumps in and out of the cold water to treat this malady. The common diseases to Native Americans are referred to with a special note on “le mal vénérien” (venereal disease), “la variole” (measles) and “la petite vérole” (small pox). This review is much richer in content and details, making it an important source for both anthropological and history of medicine information on these Native American groups. In the New annual register, or General repository of history, politics, and Literature for the Year 1794 , there is a section titled “Manners of Nations”. Topics discussed include Turkish Harems, Hindoo Culture, the Peasants of the Betuwe, and Anglo-Norman English Customs, along with a brief quote of a portion of Loskiel’s book called “Moral Character and Religion of the North American Indians”, pp. 83-87). This provides its readers with lengthy coverage of Loskiel’s section in the book on families. The point made by this editor and/or author was to point out how these observations of the Native American will help confirm and provide proof for the success of these missions, due to the changes that occur over time. Much of this article quotes Loskiel’s writing extensively, ranging from how crime is defined and dealt with within the Native American cultural setting, and how festivals and other social gatherings are planned and produced. 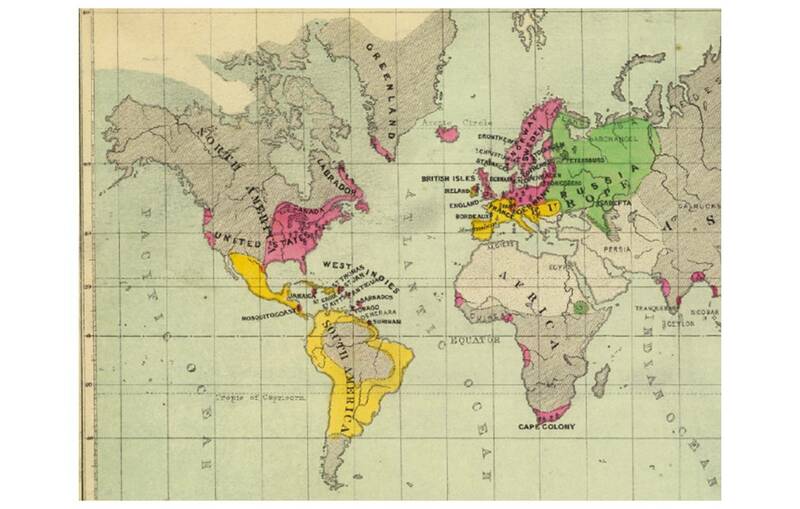 An interesting reference to Loskiel’s work is found as a footnote in Leonhard Ludwig Finke’s Versuch einer allgemeinen medicinisch-practischen Geographie…, Volume 2, p. 12 (“Zweyter AbfchnittVon den Ländern unter diefer Breite in Nordamerika, als’von Canada, Neubritannien und Neuschottland. Von Canada”, Leipzig, 1792). This essay is devoted to a discussion on the Native American cultures of Canada, and in the section with Loskiel noted, there is a description of the Iroquois, Huron and “Mickmack” Indians,with special reference made to certain body appearances such as broad and muscular features or their “red skin”. In William Marsdale’s A catalogue of dictionaries, vocabularies, grammars, and alphabets, volume 2, published in London in 1796, there is a lengthy discussion of the Native American language and Loskiel’s contibutions to this knowledge. Due to the mention of Shekomeko in Loskiel’s book, the addition of this new place to a map of North America led to his mention in numerous geography references. In Die Vereinten Staaten von Nord-amerika by Christophe Daniel Ebeling (Hamburg, 1794,), on p. 974 he mentions “Tschekomeko oder Shekomeko, im nordostlichen Theile dieser Grafschaft, oder dem Little Nines Partners, am Stissik: Berge, 5 ge. Meilen von Pouqhkeepsie.” This reference to Loskiel by Ebeling continues to reappear in the following: D. Anton Friderich Büschings Erdbeschreibung Dreizehnter Theil, welcher Amerika begreift. 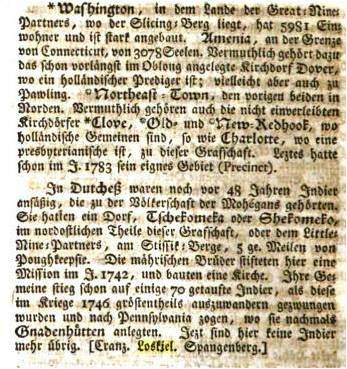 Die vereinten Staaten von Nordamerika (Hamburg, 1794, p. 1016 footnote makes reference to Loskiel); Christoph Daniel Ebeling, Anton Friedrich Büsching, in Erdbeschreibung und Geschichte von Amerika: die vereinten Staaten von Nordamerika …, Volume 4, (Hamburg, 1797), pp. 67, 720, 829. A more detailed description of the location was provided by F. Von Zach in Allgemeine geographische Ephemeriden: Verfasset vor einer Gesellschaft Gelehrten und herausgegeben …, Volume 1… Allgemeine Geographische Ephemeriden (Weimar, 1798), which included a discussion of “die Lage von Schekomeko” and makes reference to “Hudsons Fluss”, “Rheinbeck” and the local corn fields. Johann Samuel Ersch, Allgemeines Repertorium der Literatur für die Jahre 1791 bis 1795, Volume 1. Loskiel’s rich writings did not reach many of commoners of England until it was translated into English by Christian Ignatius La Trobe and then published in 1795. By then, this news was old to much of the main lands and so this late “discovery” of Loskiel’s work was in the least a political embarrassment to England and its religious leaders. Unlike the Episcopalian Churches of England and is Roman Catholic settings to the north, Lutherans and their followers like the Calvinists and Moravians had the edge on the British. This in some sense could have been a public embarrassment, depending upon whom the judge and the judged were to be. In just five years, Loskiel’s book had been discussed and these discussions published in various languages ranging from Dutch, and German, to Scandinavian and even French. Only those who were English speakers and readers were left out of this communication circuit. Following the publication of Loskiel’s work in English in 1795, more were now able to share much of what Loskiel had revealed to us about American Indian culture in general. More importantly, this small revelation also demonstrated just how successful the missions could be if they were performed correctly. 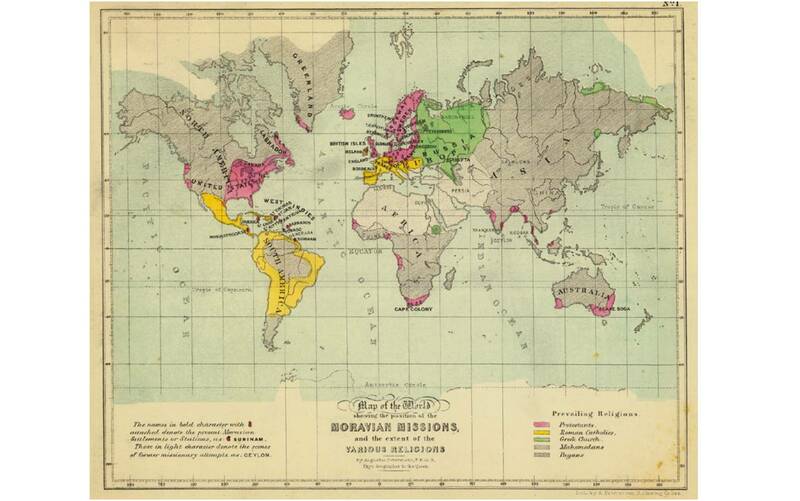 This success of the Moravian missions, when contrasted with other missionary agents and programs including those from Great Britain, left the British with no way to recuperate their public embarrassment and religiopolitical losses. Immediately following its release, this resulted in some a very critical review of Loskiel’s work by an English writer, published in The British Critic, a New Review (1795, vol.6: “Art. XII. History of the Mission of the United Brethren, among the Indians in North America. In three Parts. By George Henry Loskiel. Translated from the German by Christian Ignatius La Trobe. 8vo. 648 pp. with a Map. 8s. 6d. Stockdale. 1794″). Following a quote from the book . . . 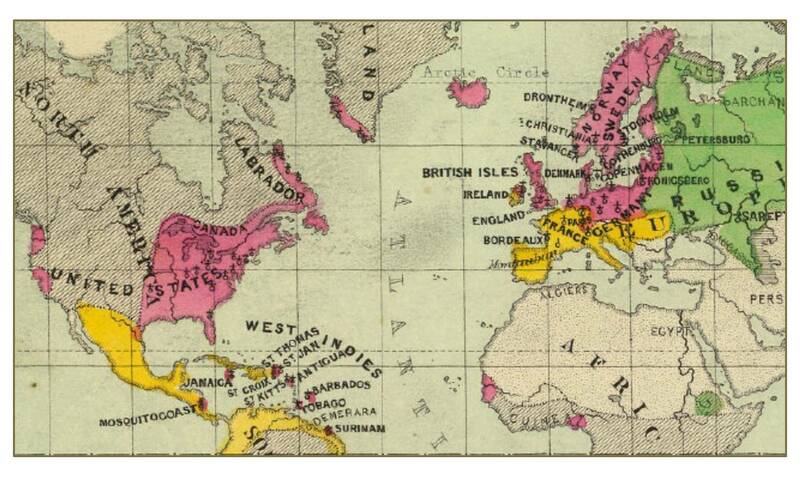 Missions in American from 1734 to 1787. HISTORY OF THE MISSION of THE UNITED BRETHREN, Among the Indians in North America. In three Parts, By GEORGE HENRY LOSKIEL. Translated from the German By CHRISTIAN IGNATIUS LA TROBE. London: Printed for JOHN STOCKDALE, Piccadilly. 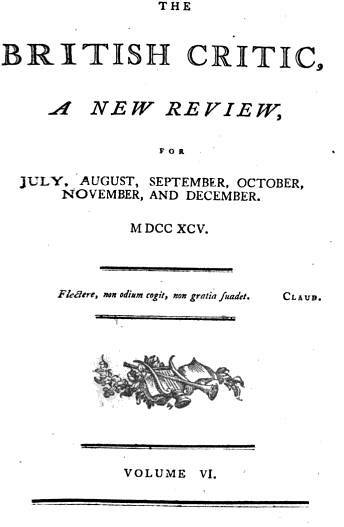 The following Account of this Work is extracted from the British Critic, for September 1795. Sieben Passions-Predigten Berlin: H.H. Wohlgemuth, 1839.